Stephen George Kaminski II passed away on December 30, 2016 after fighting a battle with cancer. Steve recently retired as a Boeing 777 Captain for Delta Air Lines. Steve started his airline career with Wien Air Alaska in 1974, was hired by Western Air Lines in 1977 and retired from Delta October 3, 2016. Steve was a loving husband to Denise Kaminski and a proud father of Stephen Kaminski III, Deven Cason and her husband Cory Cason, Tairyn Mosley and her husband, Bryan Mosley, and Jonathan Kaminski. Steve also leaves behind three deeply cherished grandchildren, CJ Cason, 5, Paisley Mosley, 2, and Elliana Cason, 1, as well as many nieces, nephews, cousins and an outpouring of extended family and friends. His extended family included all of those employed at Delta, as he spent numerous birthdays and holidays, and shared many trying times with so many of them over the course of his career. Stephen George Kaminski II, 65, Atlanta, GA died Friday, December 30, 2016 after fighting a battle with cancer. The funeral will be held on Saturday, January 7th at St John the Evangelist Catholic Church (240 Arnold St, Hapeville, GA 30354) at 1 p.m., followed by his burial with military honors at the College Park Cemetery (3600 Adams St, College Park, GA 30337). Steve was born October 4, 1951 and was a descendent of Stephen George Kaminski and Philomena Kaminski in Biloxi, Mississippi. He attended Embry-Riddle Aeronautical University, Daytona, FL with a Bachelor of Science in Aeronautics, and a Masters in Aviation Management from Delta State University. Steve was an Airline pilot for over 40 years, including 25 years as Captain. During this period, he flew numerous military charter flights using REACH call sign during Desert Shield, Desert Storm, and Iraqi Freedom. Steve was well known around the world, establishing friendships everywhere he went. He always placed the best interest of others before himself. Drinks are being shared from continent to continent while memories and laughs are being told in his honor. Steve and Denise have strong ties with two organizations they held dear to their heart, St Jude Children's Research Foundation and the Mississippi State Guard. Steve achieved the rank of Colonel and was personally selected to serve as the Deputy Commander of the organization, which involved assisting in Emergency Preparation for the state of Mississippi. Steve will be missed by all those who knew him. He has changed the lives and inspired many. His memory will live on in the lives and the work of those he influenced. Please keep his family in friends and your thoughts and prayers. 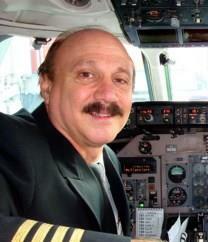 We have received word with the passing of WA/DL pilot Captain Stephen G. Kaminski II, age 65. Captain Kaminski joined Western Airlines 08-01-1977 and was based CVG and ATL with Delta Air Lines. He is the father of son Steve who is a FO B7ER based JFK. Captain Kaminski passed due to complications Stage IV lung cancer. He is survived by his wife Denise and their children. Services will be held Saturday, January 7th with visitation the evening prior...please see below....with a reception and celebration of life event following services on Saturday. The family invites all of the Delta family to attend...arrangements entrusted to Forest Lawn Mortuary of College Park, Georgia. Steve Kamiinski, II, age 65, of Atlanta, GA passed away Dec. 30, 2016. Surviving are wife; Denise Kaminski, sons; Stephen Kaminski, III, Jonathan Kaminski, Deven Cason, Tairyn Mosley, daughters; CJ Cason, Paisley Mosley, Elliana Cason. Funeral services will be held Saturday, Jan. 7, 2017 at St. John the Evangelist Catholic Church. Interment College Park Cemetery. The family will receive friends Friday evening from 5-8pm at Forest Lawn Funeral Home 5755 Mallory Rd. College Park, GA 30349. It's with great sadness I write to you today, but because you meant so much to my dad, I wanted to inform you that last night, he passed away at Emory University Hospital. According to my Mom, he was having trouble breathing while at home around 11AM and was taken to the hospital by ambulance. A short 12-hours later, he stopped breathing completely. I know that he loved his job at Delta so much and the crews he flew with regularly, so much more. I thank you for all of the prayers and support you gave him these past few months...it truly meant the world to him. He told me over Christmas that he lived a long and happy life, that he had no regrets and that he was blessed to have seen and done all that he has. I wish you and your family, a happy New Year!